Today, I am off to an art class. It is my regular monthly open access, where a group of printmakers get together in a local school and print. It is a wonderful time of sharing experiments and tea. I have been attending for two or three years and have learned much. However, it has taken a long time to gather momentum and actually feel and see what I have achieved. My previous experiences at home and school in the 50s and 60s have left me with an irrational fear of school and teachers; even today I have nightmares about the outcome of lessons; now and planned for the future. So the preparation of the mind (clearing of) is as important as the accumulation of ideas (thoughts and sketches) and the materials. Bags of regret, doubt and fear, more bags of stuff and a little pouch of excitement and joy! 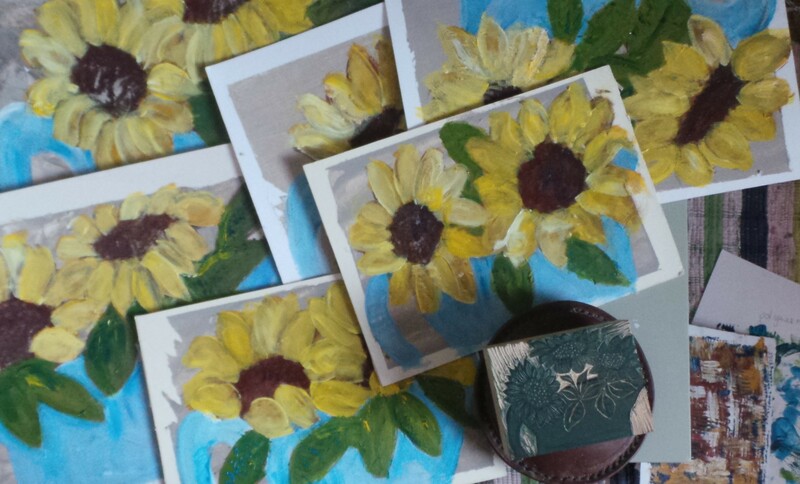 These sunflowers are the results of some oil paint (not done before) on the sketches for my wood engraving; all in progress.